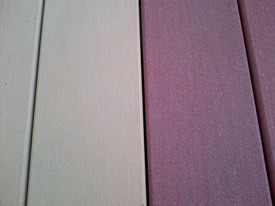 At Wits-End Trying To Get Your “Maintenance-Free” Composite Decking To Be Spot And Stain Free Like When It Was New? 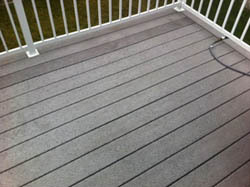 Spray and Clean Composite Deck Cleaner cleans spots and stains from within the composite decking. 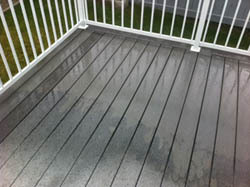 Do you have a composite deck that has black stains and spotting that you can not get cleaned? Have you tried just about every possible deck cleaner but just can’t seem to get the deck any cleaner? That’s because the stains are within the decking, where you would think it would be impossible to clean but that’s not the case. 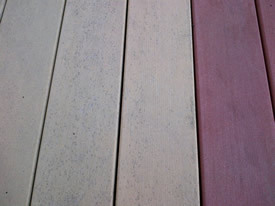 Typical composite deck cleaners, clean topically and may work well on surfaces but are ineffective at internal stains. This internal staining became a huge problem for composite decking manufacturers because composite decking was supposed to be “maintenance free”. The Trex company had a class action lawsuit filed against them for using the words “maintenance free” in their marketing. 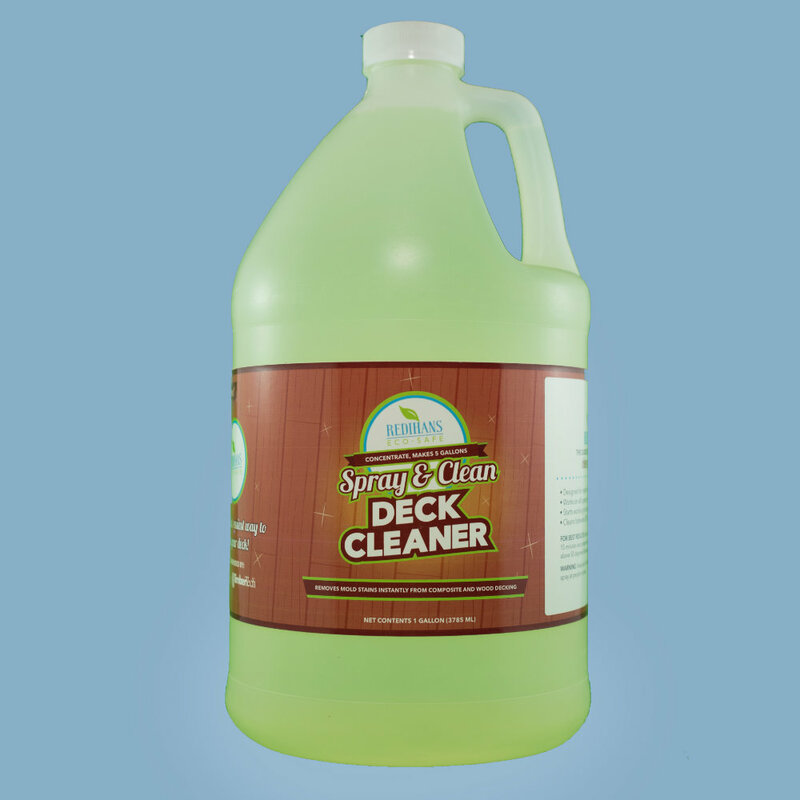 Spray and Clean Composite Deck Cleaner is the only composite deck cleaner capable of cleaning in this fashion. To formulate this product we had to use chlorine bleach but only 5%, the chlorine is transported into the composite decking by a special formula of chemicals where it can remove the stains without scrubbing or rinsing. On composite decks that has black stains and spotting that you can not get cleaned. Apply liberally to the composite decking with a spray bottle. Saturate the deck and let it sit for at least 2 hours, because of the summer heat many customers have saturated the decking in the early evening and let it sit all night, after a few hours or the next day you will need to rinse the residue off if there is any. The best way of doing this is with a light pressure washing. If a pressure washer isn’t available a garden hose will work, sometimes the aid of a deck brush will help scrub off any residue. The composite decking will continue to clean in the weeks following the initial cleaning, sunlight and rain storms will further clean the decking and in most cases that extra time is needed for the internal spots to dry up and disappear. Try the cleaner diluted 2:1 first. If that doesn’t clean use the concentrate at full strength! Each gallon of Spray and Clean will clean 250 sq.ft of composite decking. The cleaner works really well. I had tried Corte clean but it did not work so well. I used your product mixed half and half with warm water and I did not have to scrub at all. I just watched as the mould lifted and then mopped a bit more cleaner on and then rinsed. I will place an order shortly for 4 gals. Thanks, I have been buyer in York for 21 years. Finally got around to cleaning my deck. Your product worked absolutely amazing! Will definitely be my product of choice. Thanks again for the help. I’ve attached a couple of pictures for your use. Just 1 gallon does the job very well. I used your product for the first time last spring. Previously, I used Corte Clean, with lots of scrubbing for so-so results. Your product did a much better job with almost no scrubbing, and the deck looked fantastic all summer. Thanks for checking with me! Don’t know if you remember or not . . . .we put on your cleaner, Spray and Clean, but it didn’t work after a couple of tries (I think my fault as I wet the surface before application). We communicated, you replaced the 2 gallons, we reapplied (1:1 dilution), let sit overnight and fantastic success!!! Looks like a new deck. 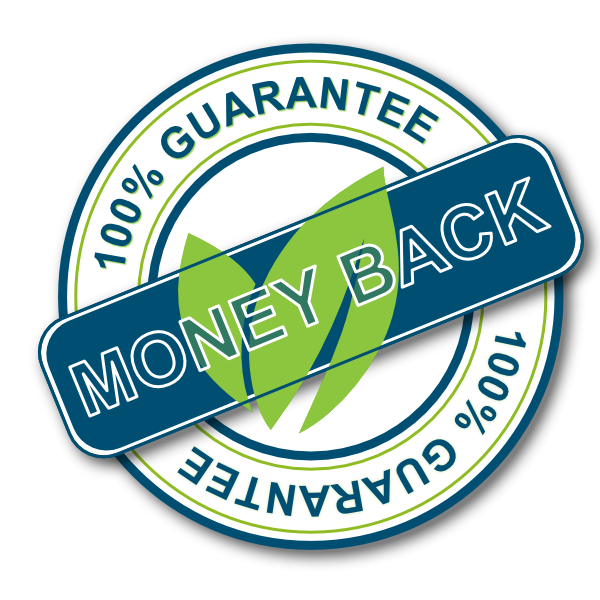 What a great product – will spread the word. Huge improvement and it took out the most stubborn of mildew stains that other products would not touch. So thank you for all your help in setting things right and going the extra mile. I am a committed Wash Safe fan!! Any new products out to protect our ‘new’ and sparkling deck? Hope all is well. 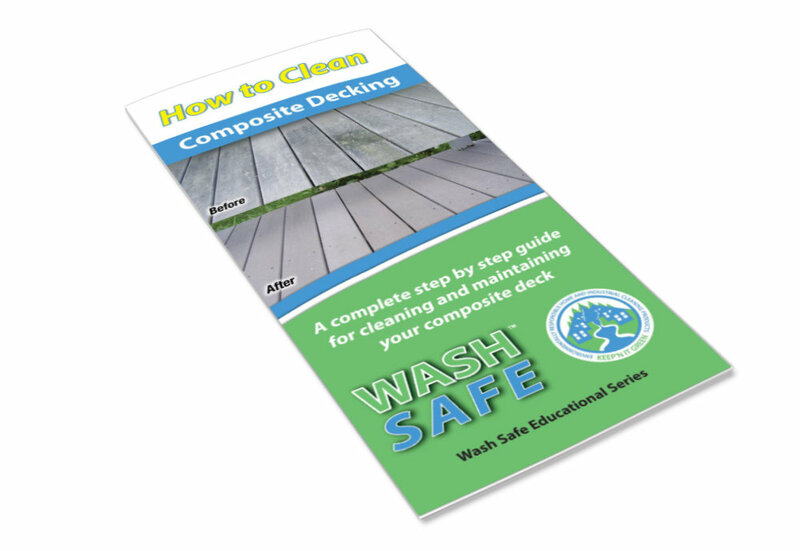 Once you have cleaned your decking with the Spray and Clean, we highly recommend that you seal your deck with our Composite Deck Seal. If your deck had been sealed from the beginning, your deck would have never obtained the mold spores with in it.